Founded by Jay Bregman, who had just sold his ridesharing company, Hailo, to Daimler Mercedes-Benz in 2016, and Eugene Hertz, the co-founder of Quidsi, which was the e-commerce company behind diapers.com and soap.com, Verifly is a simple solution for part-timers who need business insurance. And nearly everyone should have business insurance if they’re doing any kind of service job given how litigious America is. In fact, according to a study from the Institute for Legal Reform more than 34 percent of qualified small businesses have had a lawsuit filed against them in the past 10 years, and around 40 percent of all sole proprietor businesses aren’t insured. When it launched, Verifly offered coverage starting at $1 million for a price of $10 per-hour, per-flight. That may be a great deal for a casual operator, but it’s worth noting that pilot’s insurance for drones typically runs between $600 and $800 per year, according to the website UAV Coach. The company is taking the same approach with gig work. Anyone from photographers and DJs to magicians and clowns — along with the legions of part-time handymen and women out there — can get insured for at least $1 million for just $5 per-hour, per-job. Verifly says per-hour prices decrease if a customer buys a longer policy or extends their policy, and costs can change depending on what work a customer does, the limit that customer sets and whether there are any additional coverage terms that are added. Using a customer’s ZIP code, Verifly places potential policy holders in a risk territory, which then adjusts the price of the insurance based on historical loss data. The company offers policies from just one hour and up to one month without an annual contract or commitment. 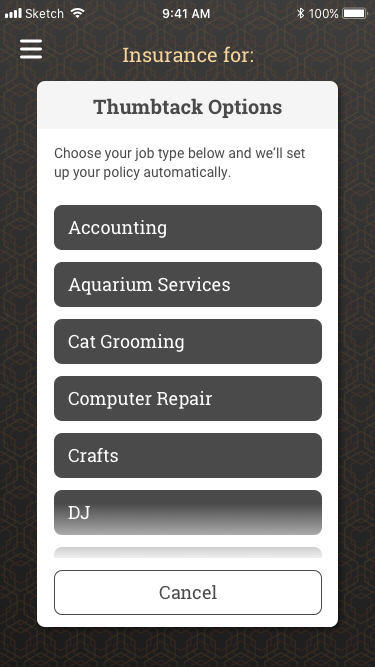 To apply for a policy, users simply open the company’s app and select the type of work they do. Users then set the duration of their coverage, from an hour up to one month. 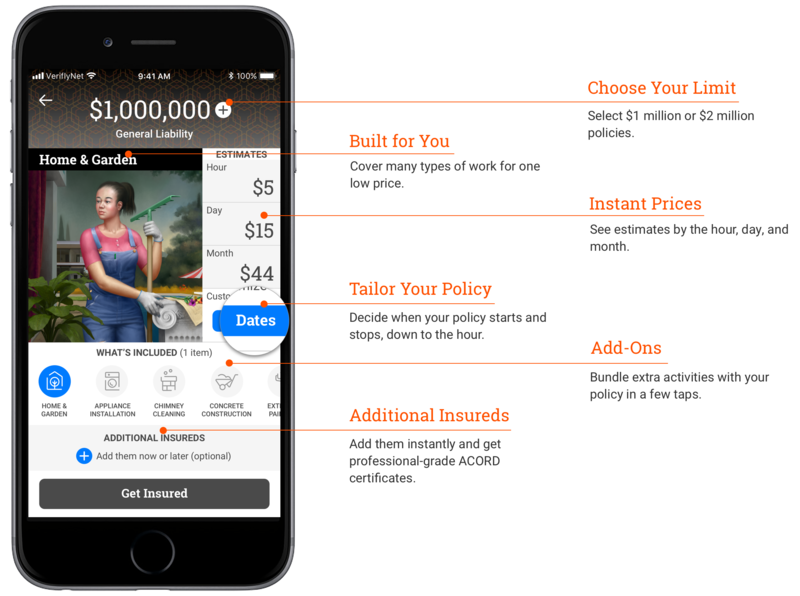 Once that’s done, the app will provide a certificate of insurance that customers can refer to. Again, price is important here. While Verifly will insure someone in minutes for $5 per hour, a quick search online shows business insurance prices beginning at $21 per month, with others offering quotes at $30. So, if a “gig” runs over an hour and is less of a part-time thing and more of a job, the Verifly coverage may not be the best bet. New York-based Verifly doesn’t provide the insurance itself — that’s done by the massive insurance holding company, Markel, but through its apps available on iOS and Android and through its website, the company is a gateway to insurance. So far, the company has raised $7 million in venture funding from investors including Slow Ventures and individuals like Sam Shank, the co-founder and chief executive of HotelTonight.